A good esthetician can help you develop a healthy skin care routine, perform skin-softening exfoliation treatments and, in some cases, help clear up acne. But an esthetician is not a medical doctor, so there are some things that she can't do. If you're hoping your esthetician can help you get your hands on a tube of acne-fighting Retin-A (tretinoin) or Epiduo, you'll be disappointed. Estheticians can't dole out any prescription acne medications, even topical ones. If you need a prescription acne medication, you'll need to see a medical doctor instead. An MD, preferably a dermatologist, has the knowledge and experience to give you the acne medication that is right for you. Got a funky rash or some mysterious problem going on with your skin? Your esthetician can't give you a diagnosis. Even if she knows exactly what the problem is, professionally she can't make a diagnosis. It lies outside the scope of her qualifications. If a client comes in with an undiagnosed condition, the esthetician is required to refer that client to a doctor. So don't go to your esthetician expecting her to identify your rash. 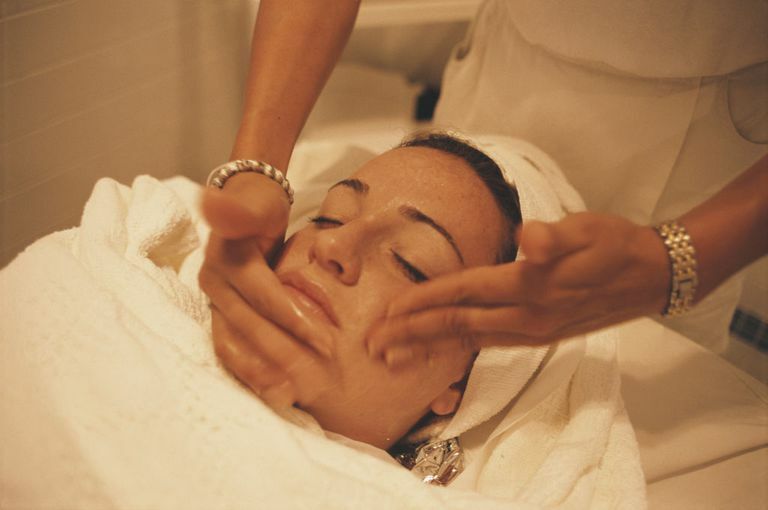 That said, an esthetician can offer cosmetic treatment for any known skin condition, such as acne, eczema, or rosacea. Estheticians can only perform cosmetic procedures that work on superficial layers of the skin. That means common beauty treatments like Botox and Restylane, laser treatments, and deep chemical peels are out. These are considered medical procedures, not cosmetic, so they can only be done under the supervision of a doctor. And, although regulations vary, in most states estheticians cannot remove milia (those pesky little white bumps). To remove milia, the skin needs to be pierced with a sharp instrument called a lancet. Making an opening in the skin, however small, is a no-no for anyone except medical professionals. Surprised? It's true. Estheticians can't treat any form of severely inflamed acne, often called cystic or nodulocystic acne, unless under a doctor's recommendation and/or supervision. To effectively treat severe inflammatory acne you'll need a prescription medication. This means you'll deed to see a dermatologist instead. This is especially important since severe acne increases the chance of scarring. Even if you're seeing a dermatologist for your acne, you can still have treatments done by an esthetician if you so choose. Just make sure to get your derm's OK first. Above all, find an esthetician you can talk freely with. Don't be afraid to ask questions. Knowing what your esthetician can (and can't) do will ensure you're happy with your treatment results. Gerson, Joel. Standard Textbook for Professional Estheticians. Ed. Albany, NY: Milady Publishing, 1999. Print. "Questions and Answers About Acne." National Institute of Arthritis and Musculoskeletal and Skin Diseases (NIAMS). Jan 2006. National Institutes of Health. Zaenglein AL, Pathy AL, Schlosser BJ, Baldwin H, et al. "Guidelines of Care for the Management of Acne Vulgaris." Journal of the American Academy of Dermatology. 2016;74(5). Salon Acne Facials: Can They Really Clear Your Skin? Is Lemon Juice the Secret to Clearing Your Acne?